Does the number of pocket springs mean better quality? The type of springs and the spring tension is more important than the number of springs within a mattress. 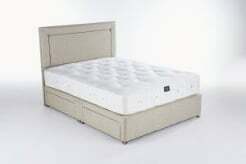 Cage sprung, open coil and continuous coil are mass produced and are cheap to make but you would not get a good quality mattress with any of these spring systems. Pocket springs are far superior. We have two different types of pocket springs, Synthetic spun bond springs – these are our entry-level spring unit which are glued together with a polyester style material. The least breathable and responsive. These springs are in our Origins range. Calico encased pocket springs – Encased in a breathable natural calico cover which are then stitched together. Highly responsive and much more breathable. These springs are in most of our Artisan range. Spring tension is based solely on an individuals body weight to give them the correct level of support. Once you have the correct spring tension then the upholstery layers are based on personal preferences, sleeping habits and budget. 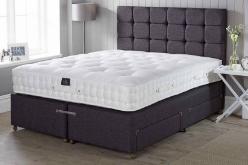 I trust this was helpful and if you would like any further information or would like to discuss the suitability of any of our mattresses please do not hesitate to contact the office on 0161 437 4419.